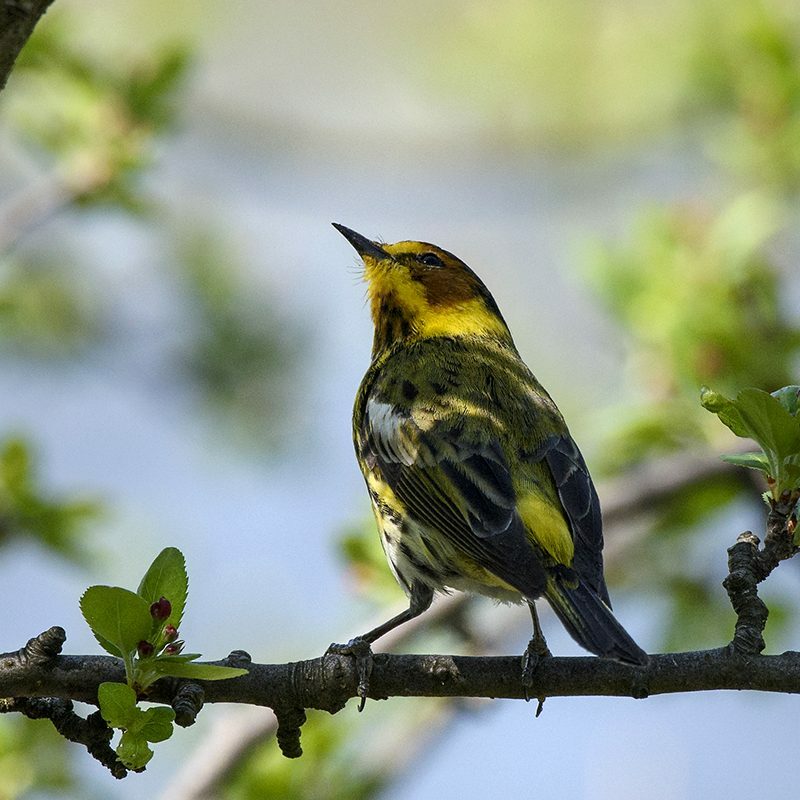 Today is National Migratory Bird Day, set smack dab in the middle of May—the month to look for warblers, vireos, thrushes, sparrows, and some shorebirds, as they migrate through the Chicago area. Most birders might agree that the highlight this time of year is warblers. It is for me—they are tiny jewels with wings. I feel totally blessed if I can see a few during migration. Since these birds are so small, they usually wait for favorable winds to help them travel. Any night with southerly winds will have the birds moving; new birds arrive while others depart. Every year is different, so it pays to watch the weather report if you want to see these beauties while they are passing through. The good news is that there are a few warblers that actually nest in our area, so if you miss them during migration you can often find the nesting birds later in the summer. 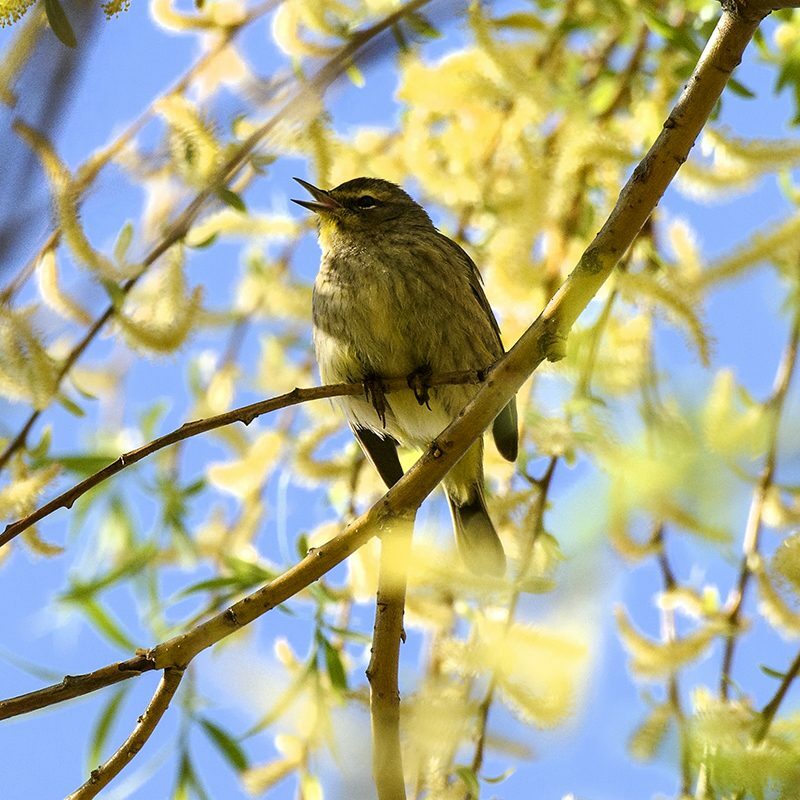 A great place to look for warblers, like this palm warbler (Setophaga palmarum), is in all the willow trees around the Garden. A less common warbler is this beautiful Cape May warbler (Setophaga tigrina). 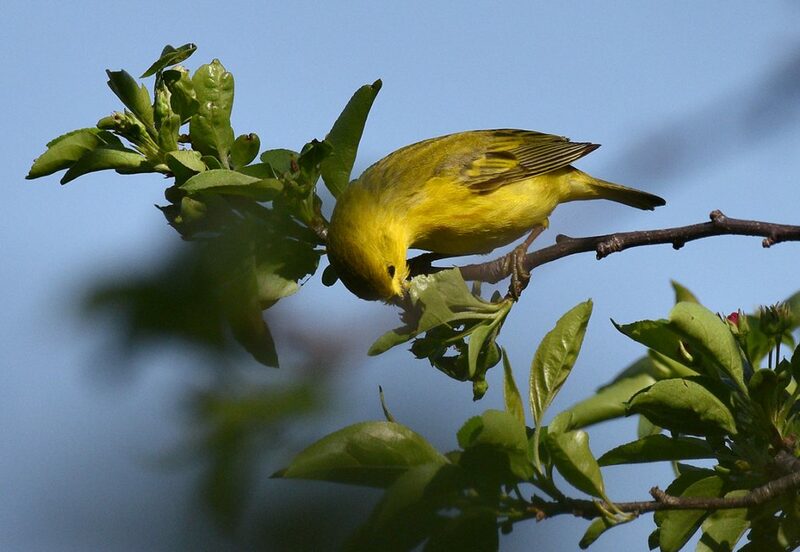 A yellow warbler (Setophaga petechia) looks for insects. These golden birds actually nest at the Garden. Knowing when they arrive is only half the challenge. Where they will land is the second part. I’ve been surprised on many occasions to find warblers in very public places. If there is a tree, some green, or water, you have a chance at spotting a warbler. 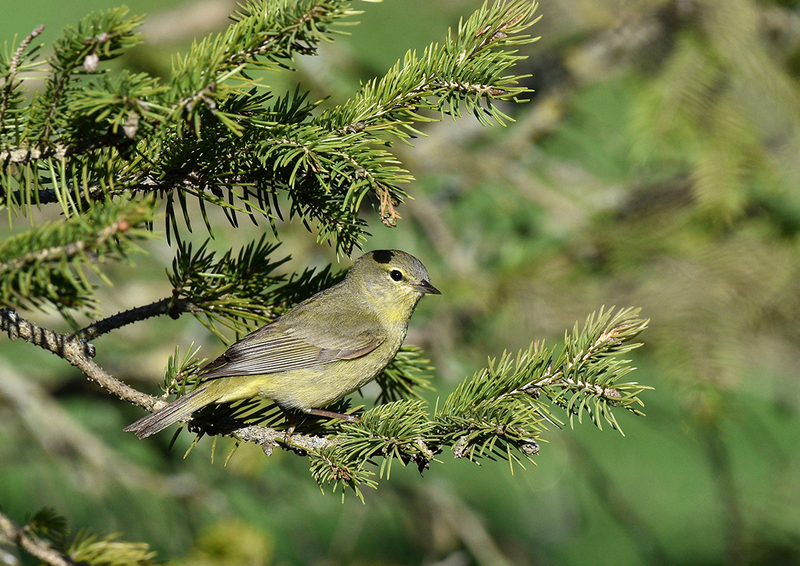 If you see a tiny bird, quickly darting in and out of a tree, there is a good chance you have found a warbler. Oaks and willow trees are particular favorites. The birds need a food supply along the way to fuel their journey. Most of them are insect eaters, and some supplement their diet with seeds and nectar from flowers. While the cold spring delayed the plants a bit, the insects come out as soon as it is above freezing and you can see the birds darting around eating as many as they can. If you want to attract warblers to your yard, plant native trees and shrubs in your yard and be sure to add a shallow water dish. Here you can see how this warbler got its name. 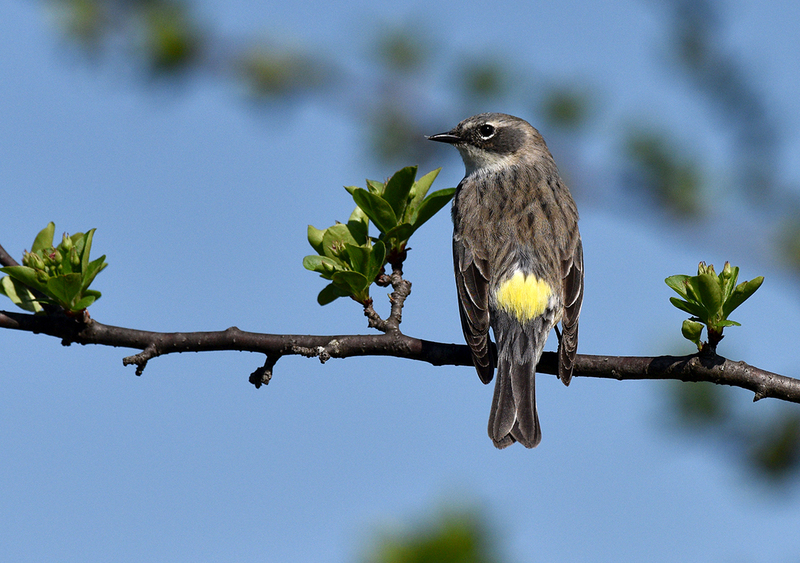 The yellow-rumped warbler (Setophaga coronata) is one of the most common warblers you will see here. A very understated orange-crowned warbler (Vermivora celata) keeps an eye on me. 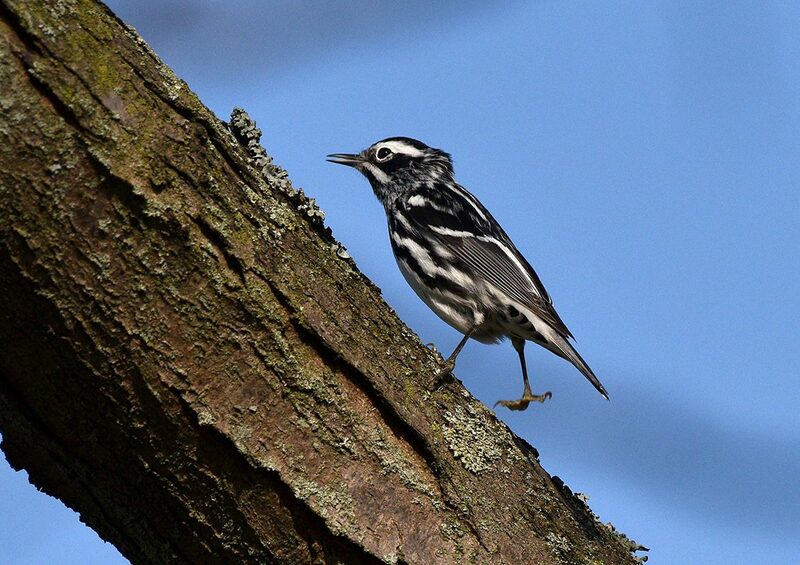 Black-and-white warblers (Mniotilta varia) can be found hopping up and down the bark of trees looking for insects. Migrating birds are one of nature’s greatest wonders. Different birds migrate at different times of the year, but all told, millions of birds make the trip north and south each year, navigating all sorts of hazards along the way. I am in awe of these tiny birds that travel so many miles. They are the elite athletes of the avian world. The cooler than average spring did allow a few loons to stay longer than usual around the Garden. It was really fun seeing them stealthily appear from seemingly out of nowhere. 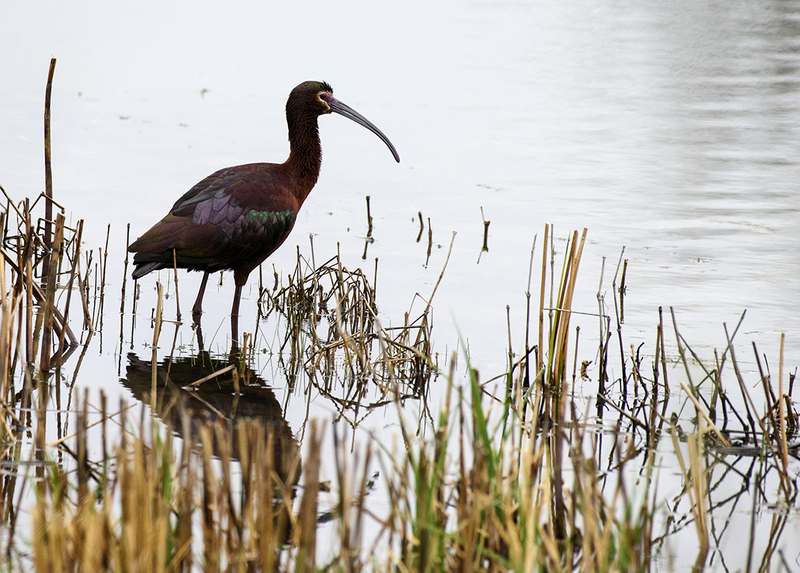 A major rarity showed up for just one day, a white-faced ibis. I was lucky to be around to see it; a first for me, and I believe the Garden as well. Wow, what a treat! I’ve never seen this bird before. White-faced ibis (Plegadis chihi) is a very rare visitor to the area. The first wave of warblers arrived early in May and many from that group have moved on, although you can still see palm, yellow-rumped, black-and-white, and Nashville warblers at the Garden now. There should be several more waves before the month is over, as well as a few interesting sparrows and vireos. 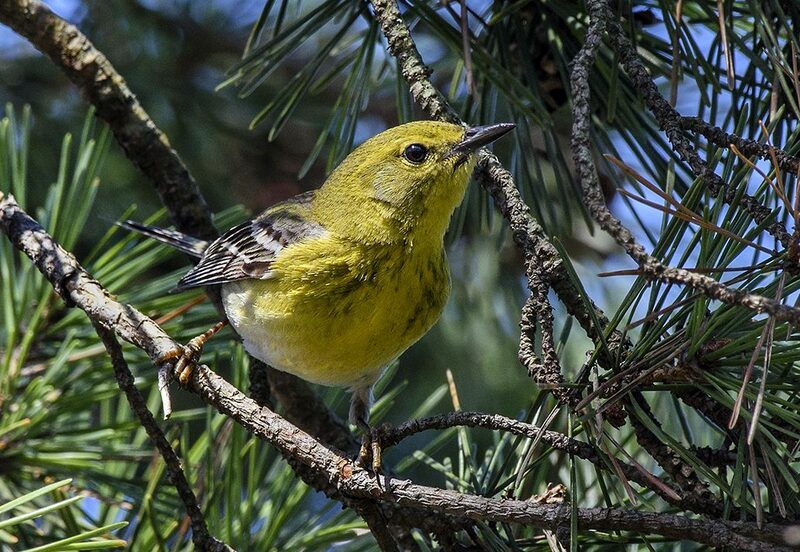 Warblers migrate at slightly different times. There are those that show up at the end of April and early May, those that you will see mid-month, and a few late ones that show up at the very end of the month. I like to go out every day in May, just in case a new wave of warblers has shown up, I hope you will too! 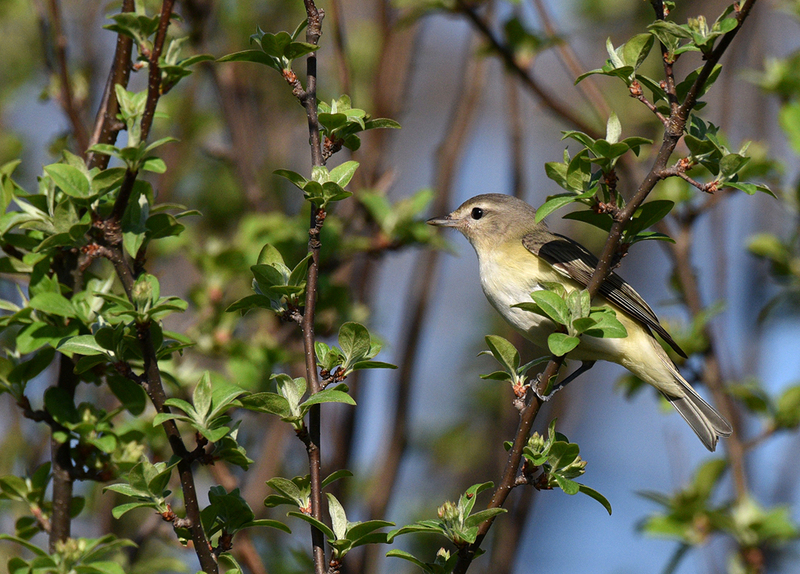 The warbling vireo (Vireo gilvus)—not a warbler, but its song sounds like one. Join me and #birdthepreserves this month. My top five migration places to visit in the spring are the Chicago Botanic Garden, Montrose Point Bird Sanctuary (the magic hedge) in Chicago, The Grove in Glenview, LaBagh Woods in Chicago, and Ryerson Woods in Deerfield. Thank you so much for sharing this post and the wonderful photographs! Very inspirational, to get into birding!